BE RICH IN WHAT MATTERS TO GOD! The readings for this Sunday warn us of the folly of placing our worship in material goods. Our first reading (Ecclesiastes 1:2; 2:21-23) could have been the basis for Dickens' "A Christmas Carrol". One could imagine it coming out of the mouth of Jacob Marley. It is a dire warning that the riches we toil for in this life are left for others to enjoy. "Vanity of vanities, says Qoheleth, vanity of vanities! All things are vanity! Here is one who has labored with wisdom and knowledge and skill, and yet to another who has not labored over it, he must leave property. This also is vanity and a great misfortune. For what profit comes to man from all the toil and anxiety of heart with which he has labored under the sun? All his days sorrow and grief are his occupation; even at night his mind is not at rest. This also is vanity." 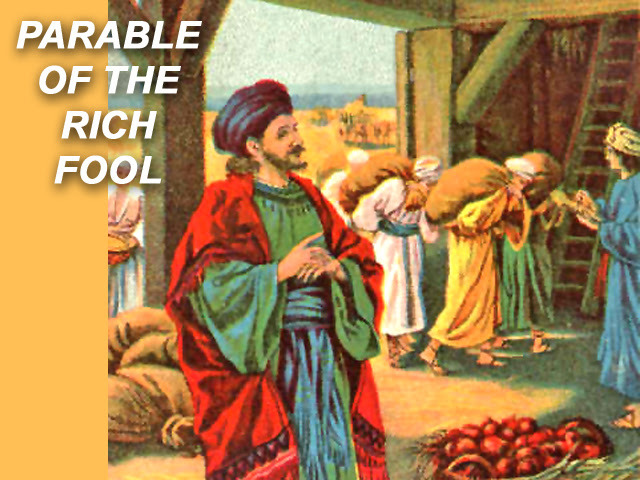 Our Gospel reading (Luke 12:13-21) builds on this theme with the parable of the Rich Fool. First, Jesus refuses to intervene in a property squabble among two brothers and then follows up with the parable to drive home the point. "Then he told them a parable. 'There was a rich man whose land produced a bountiful harvest. He asked himself, 'What shall I do, for I do not have space to store my harvest?' And he said, 'This is what I shall do: I shall tear down my barns and build larger ones. There I shall store all my grain and other goods and I shall say to myself, 'Now as for you, you have so many good things stored up for many years, rest, eat, drink, be merry!'' But God said to him, 'You fool, this night your life will be demanded of you; and the things you have prepared, to whom will they belong?' Thus will it be for all who store up treasure for themselves but are not rich in what matters to God.'" In our Epistle reading (Colossians 3:1-5; 9-11), St. Paul tells us what really matters to God and how we are to rightly order our lives. "Brothers and sisters: If you were raised with Christ, seek what is above, where Christ is seated at the right hand of God. Think of what is above, not of what is on earth. For you have died, and your life is hidden with Christ in God. When Christ your life appears, then you too will appear with him in glory. Put to death, then, the parts of you that are earthly: immorality, impurity, passion, evil desire, and the greed that is idolatry. Stop lying to one another, since you have taken off the old self with its practices and have put on the new self, which is being renewed, for knowledge, in the image of its creator. Here there is not Greek and Jew, circumcision and uncircumcision, barbarian, Scythian, slave, free; but Christ is all and in all." It is often said that "you can't take it with you", referring to money, fame and possessions. But there is one thing that we can take with us beyond the grave, Grace. Grace is the currency of God; it is what matters to God and we accumulate it by following the advice of St. Paul in today's Epistle, by seeking what is above, where Christ is.